Dead Island is known for having the most successful trailer of any game ever. It was a beautiful cinematic experience. But sadly, as details of the game itself emerged, and after it was shown at conventions around the world, doubt began to set in about whether this five-year-long project would live up to the hype. If all of the reviews so far are any indication, it has largely failed. I played it at PAX for about 15 minutes, and that was all I could take. The controls are clunky, the graphics off-putting, and the collision detection abysmal. Even before the immediate and nearly unprecedented post launch issues that have made this one of the worst launches in video game history, Dead Island's introduction to the masses had failed. And the problems for developer Techland and publisher Deep Silver just kept coming. First of all, Steam users figured out that the horribly buggy release that they had paid $50 for was actually an unfinished dev build of the Xbox 360 version that had been released by mistake. A gigantic error. I can't think of a single situation where something like this has happened before. It would be comical if it wasn't so inept and unfair to the users who were most interested in getting the game fast. A huge Day 1 patch has apparently fixed some, but not all, of the many issues in the PC version of the game. But it's just gotten worse from there. Of interest is the second line from the bottom, [Skill("FemistWh*rePurna");]. 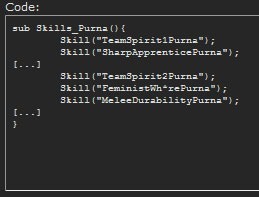 It refers to a skill that players can assign to the female character Purna, which makes her attacks do 15% more damage to male characters. In the game, that skill is called Gender Wars. But somewhere in the coding process someone wrote that nasty little sexist descriptor for it, probably meaning to remove it later. Unfortunately for just about everyone, that never happened. Deep Silver is not a small publisher. Dead Island might be their highest profile release yet, but it's far from their first. Techland has developed AAA games before as well, albeit mediocre ones, and worked on Dead Island for almost six years. How, after all that time and effort by two experienced companies, did this game come out with all of these problems? Tiny indie developers the world over pull off better releases than this every day. More power to 'em. I was pretty disappointed at this game. The game is great and has lots of potential. But it feels like there was little to no game testing before actual release. Lots of obvious problems that are usually fixed long before release. If they can fix this mountain of minor bugs I might consider playing again. Was the trailer really that great, though? I saw the commercial on TV and was surprised by how bad the graphics looked. I hope you weren't talking about this trailer. If I was a coder I'd put stuff like that in every line I could. Hahah.